MADISON, WI (Aug 5, 2016) – Imbed Biosciences announced today that it has received clearance from the Food and Drug Administration (FDA) to market its patented Microfilm™ wound dressing—Microlyte® Ag, for human use. 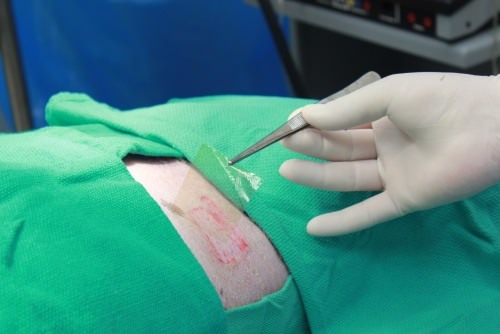 The dressing is an ultrathin hydrogel sheet as thin as human hair that is able to intimately conform to the contours of an underlying wound-bed. FDA has cleared Microlyte® Ag for management of hard to heal wounds under prescription use, and for small cuts and burns under over-the-counter use. Like many dressings used today to treat burns and chronic wounds, Microlyte® Ag contains ionic and metallic silver to kill bacteria, but in much smaller quantities. 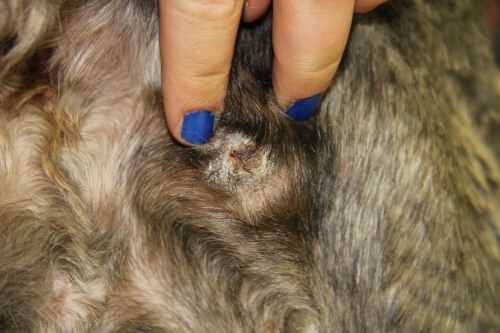 This chronic pressure sore on an Irish wolfhound received conventional treatment for more than three months at the UW–Madison School of Veterinary Medicine. 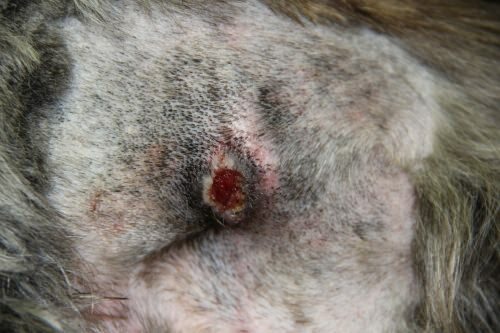 Fourteen days after application of Microlyte, the sore is closed and well on its way to healing. “Silver is an excellent antimicrobial agent,” said Ankit Agarwal, PhD, co-founder and CEO of the company, “as it is active against a broad range of bacteria and yeast. But the loadings of silver found in conventional silver dressings can be toxic to skin cells involved in wound healing”. Microlyte® Ag dressing contains as little as 1% of the silver found in other dressings in the clinics today, and is still effective in killing more than 99.99 percent of bacteria that it contacts, including some of the nastiest hospital-acquired superbugs such as methicillin-resistant staph aureus (MRSA) and vancomycin-resistant enterococcus (VRE). Microlyte® Ag overcomes a key problem with existing dressings — stiffness. A wound has bumps and fissures that are hiding places for bacteria. The dressing inherently adheres to moist wound surfaces and is so thin and flexible that it conforms into the fissures, leading to the sweet combination of greater destruction of bacteria at much lower doses of silver. Microlyte® Ag has several other advantages. It retains moisture yet is ultra-thin and breathable to maintain a moist wound healing environment. The slow release of silver means the dressing can remain in place to provide antimicrobial effect for several days. And because the material is a hydrogel (a water-based gel), it can simply be rinsed off as needed before replacement. Experience with animals shows that the ultra-thin dressing simply sloughs off as the wound heals, so it has to be only reapplied, not painfully removed from a wound. All of these advantages should reduce the need to change dressings, which can be painful enough to require sedation, especially in children. Imbed’s Microlyte dressing is applied to a wound on a pig. The ultra-thin dressing conforms to the wound, bringing the antimicrobial silver into direct contact with bacteria. The dressing will compete in North America in the $2-billion market sector of “advanced wound dressings,” which are used to treat diabetic ulcers, venous ulcers, burns, bedsores and other difficult wounds. “We are doing a limited release of Microlyte® Ag dressing in certain U.S. hospitals to study impact on different wound types”, said Agarwal. The company plans to reach the market through licensing agreements with hospital suppliers and is discussing commercial-scale production of Microlyte® Ag dressings. “We are excited to support the launch of this new advanced wound care dressing that can help heal painful wounds in millions of patients in U.S.”, said David Guinther, a partner in the venture capital group– WISC partners. “We will continue to support executive team in recruiting global distribution partners and product line expansion”. Our mission at WISC Partners is to create wealth by helping a portfolio of well-chosen entrepreneurs in Wisconsin to build great companies that solve important customer problems. We accomplish this by injecting Strategic Operating Capital into these investments, which couples funding with company building experience, product and market expertise, corporate and business development networks, and highly engaged executive support. We are comprised of University of Wisconsin alumni, with offices in Madison, WI. For more information, please visit www.wiscpartners.com.